Pressed vegetable juices are growing in popularity on a global level, so it should be no surprise that medical marijuana patients, caregivers and healthcare professionals are now looking into the health benefits of juicing the Cannabis plant as well. Vegetables are typically defined as a “herbaceous plant grown for an edible part, usually eaten as part of a meal.” This typically refers to the leaf, stem, flower, or root of a plant. In 1967, the meaning of vegetables changed to, “any plant cultivated for food, edible herb or root.” Some vegetables may be eaten raw, while others must be cooked in order to be edible. When certain fruits and vegetables are heated, they lose a majority of their beneficial enzymes and nutrients. Cannabis is much the same. Aside from the fact that cannabis is technically a vegetable with many of the same nutrients as other leafy greens (like fiber, iron and calcium), it is jam-packed with beneficial cannabinoids that are unique to the Cannabis plant. Juiced cannabis is a nutritionally-dense, very potent medicinal compound, without the psychoactive components normally activated when heating the plant. The high concentration of raw cannabinoid acids in juiced cannabis, coupled with the perfect balance of fatty acids, could help improve cell function and reduce damage caused by free radicals. Additional benefits of raw, juiced cannabis include reduced inflammation and the facilitation of two-way cellular communication. Many cannabinoids also have anti-tumor properties which are readily available through the consumption of raw marijuana. While smoked or vaporized cannabis can in fact be used as a medicinal therapy, juicing raw cannabis can help prevent health issues before they even arise. Coined the “most important vegetable on the planet” by some, mainly because it can assist with immune system function, provide anti-inflammatory benefits, and improve bone metabolism and neural function. In fact, research has shown medical marijuana may even help inhibit cancer cell growth. Only when you decarboxylate THCA, turning it into THC, does it cause psychoactive effects or “the high” most associated with smoking cannabis. 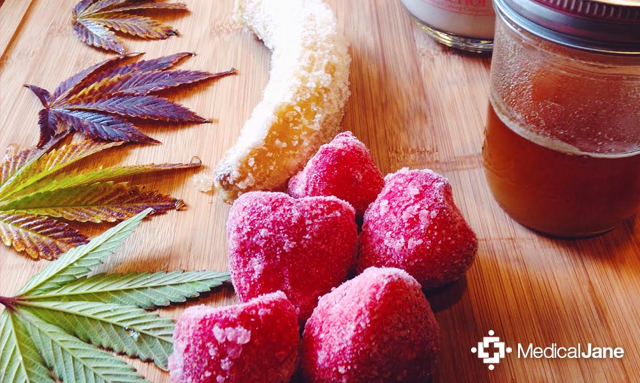 According to Dr. William Courtney, a dietary raw cannabis specialist and a strong believer in the plants healing powers, “you are actually walking away from 99% of the benefits cannabis provides when you cook or smoke cannabis.” However, in its raw form, the cannabis plant contains both THCA (Tetrahydrocannabinolic-acid) and CBDA (Cannabidiolic-acid), two cannabinoids known for their medicinal benefits; each of which must be heated in order to produce THC and CBD, respectively. Only when you decarboxylate THCA, turning it into THC, does it cause psychoactive effects or “the high” most associated with smoking cannabis. Additionally, the body is able to tolerate larger dosages of cannabinoids when cannabis is consumed in the raw form. This is because when you smoke cannabis, the THC actually acts as a CB1 receptor agonist and your body can only absorb ~10 mg at a time. The FDA has actually approved a tolerable CBD dose of 600 mg/day as a new investigative drug. This makes the medical potential of drinking the juice containing 600 mg of CBDA, far greater than when you heat the cannabis. Considering CBD percentages are typically below 1% in most strains available in dispensaries across the nation, it is nearly impossible to smoke enough in one day to ingest a 600 mg dosage of CBD. One-way traffic to nerves is the main cause of inflammation in the body. Under this scenario, immune cells are being continuously attacked and nothing is communicating with the nerves to tell them to calm down. However, studies show that when you add cannabinoids to the equation, a two-way communication is made possible, resulting in reduced inflammation. The cannabinoids work to prevent and fight symptoms by providing nerves with this two-way communication. We all have cannabinoids in our bodies; these are known as endocannabinoids. These endocannabinoids bind to different receptors throughout our bodies and are very effective at regulating immune functions, nerve functions, and even bone functions. The endocannabinoid system acts as a modulator in fine-tuning a lot of these systems. Supplementing an impaired ECS with plant cannabinoids will bring it back to optimum function, thus provoking an improvement in any associated conditions. When it comes to juicing, fresher is better (like most vegetables). Cannabis that has been dried and prepared for smoking is not suitable for juicing. Do not be surprised if your local dispensary does not have a fresh supply of raw cannabis available. Many patients and caregivers are required to grow their own medicine to get access to quality starting material. Dr. William Courtney recommends that patients juice 15 leaves, and 2 large (2 to 4 inches long) raw buds per day. Raw buds are flowers harvested when the THC glands are clear (rather than amber). It is recommended that you mix in another vegetable juice to cut down on the bitterness of the raw cannabis. 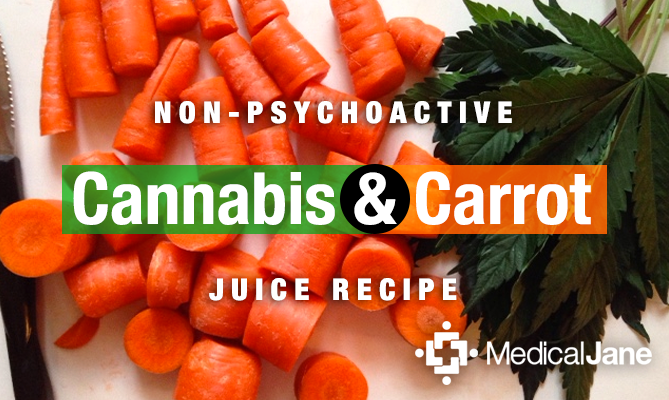 A popular choice is carrot juice, and a ratio of 1 part cannabis juice to 10 parts carrot juice is a good rule of thumb. 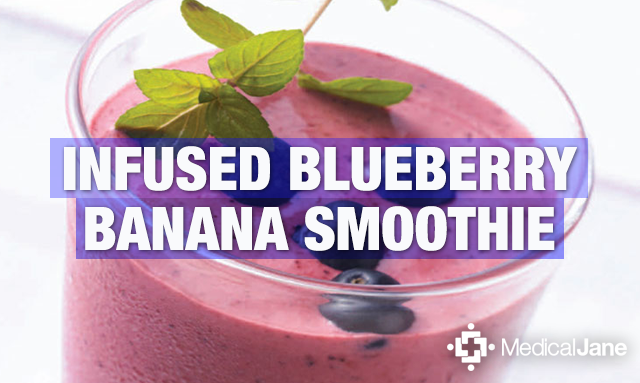 Split the juice drink into 3 parts and drink with each meal, or store for up to 3 days in a tightly sealed container in the refrigerator.